A tubeful of fluffy comfort. This 2 oz. tube loves to travel! I found FHF in my local towns drugstore. I love anything that says Farmhouse! So I thought I'd give it a try. It smelt amazing in the store. Well I have had a really severe dry patch on my finger and after a week of using this lotion it is completely gone. Not only does it have a light and airy scent it actually works! I went back and bought hello yellow and one of the Whoopie lip balm. And now I plan on ordering other scents and also gifts for my mom and mother in law for mother's day! I'm addicted now! Fluffy Bunny is such a unique and amazing scent! I always get so many compliments when I use it and have recommended it to a lot of family and friends. My hands feel so nice. Looking forward to buying the bigger bottle soon, I just love it! Smells wonderful and is very hydrating! I keep a tube in my purse and two around the house. Just love this product! 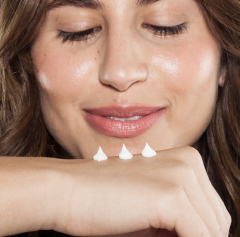 A rich hand cream that is not greasy! I have searched for ages for a hand cream that leaves my hands soft but not greasy, and finally found it! I love Fluffy Bunny FHF products. One of the best scents of all the products I've tried here. The hand cream is luxurious and is the perfect size for my purse. Highly recommended. I love love loveeeeeee fluffy bunny. It smells like heaven and makes me feel like a happy little fluffy bunny. I keep this in my desk at work, by my bed, and in my purse so I can always smell sweet and hoppy! One of my favorite hand creams! I have worn Fluffy Bunny hand cream for the last five years. I love giving it as an Easter gift, too! I love this stuff! It really stands out from other hand creams because it is so thick and creamy, whereas other brands will leave me feeling like I put nothing on my hands 30 minutes later. I work in the cosmetic industry so I'm washing my hands constantly and not only does this keep my hands from cracking from the dryness, I always get compliments on the scent! This location has the nicest scent! I get compliments on it all the time! Carry this with me every where...even while "working"
I have a bike tour company and am often on the bike with guests. I share this cream with them at the end of our ride. We all bond over how it feels on our hands and the sweet aromas. Gave a tube to my best friend who introduced me to these products. Will be buying again. It is important to me that these products are cruelty free and that rescues are done. I use this hand cream daily now and just love it. My hands were dry with cracks at the edges of my fingernails from all my work in the garden. They actually hurt sometimes when I touched them. After using Fluffy Bunny, they felt better immediately and were softer in days. The cracks healed up, and I'm no longer ashamed of them. The shea butter does wonders without being 'slimy', and the scent is yummy. This Fluffy Bunny Shea Butter Hand Cream was my first introduction to Farmhouse Fresh, and I've never looked back! My hands get so dry, especially during the colder months, and this is truly the only moisturizer that both works and works over time! Not only that, but my hands are incredibly soft, and it smells like a dream. When I say there is nothing better, I mean it!....well, except for maybe the Marshmallow Melt Shea Butter Hand Cream!! I give this as gifts to every teacher, coworker, and friend.